A vacuum tube or transistor amplifier, followed by a milli-ammeter may be employed asÂ a detector. Some of such devices have arbitrary scale values, sometimes with variable gain, and are designed simply as balance indicators. The sensitivity may be of the orderÂ of a microvolt per scale division or better, and the input impedance is in the range of meg ohms, so the current drawn from the measured source is usually negligible. Such instruments have the advantages of ruggedness and portability that permit their use under conditions that would be extremely difficult for a sensitive suspended galvanometer. AnÂ­other possibility is a VTVM, if sufficiently low scales are provided. Instruments are availÂ­able with ranges such as 5-0-5 or 10-0-10 microvolts giving a fraction of a microvolt per scale division, the input impedance is in Mega Ohms. On any of such devices with high input impedance, the indication is practically the Thevenin voltage produced by the unbalance of the bridge or potentiometer, unless the circuit is itself of very high impedance. ElecÂ­tronic detectors are often useful however, there may also be difficulties connected with their use. It is desirable to ground the circuit, if possible, at one of the detector terminals, otherwise stray effects and the capacitance of the body may introduce errors in the meter indications. Also, ac pick-up must be avoided unless the detector internal circuit is immune to it. 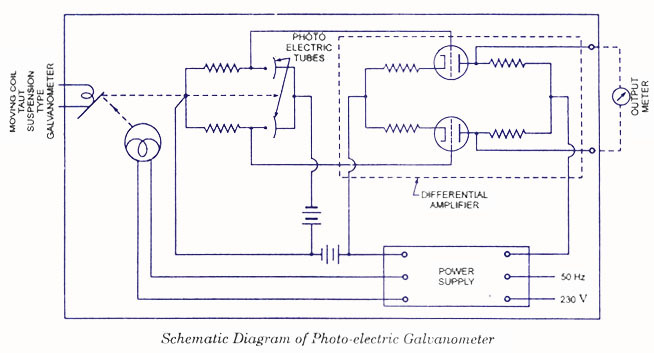 Another type of electronic detector is shown in figure and essentially consists of a taut-suspension type galvanometer of comparatively low sensitivity, photo electric tubes, an amplifier, and an output meter. 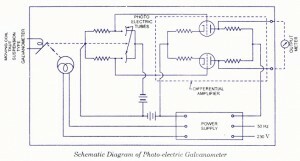 The galvanometer used is particularly designed for a low period. The combination gives high sensitivity and fast response.